Beet hummus atop one of Liz’s gluten free crackers. Adapted from Thug Kitchen’s Party Grub. Whip it all up in a food processor or Ninja-style (better). Cooks’ Emporium was lovely enough to post this recipe is by Laura Doerr, whose fabulous food blog, Ways to My Heart, takes the cake! 1. To make honey syrup, heat equal parts water and honey until honey dissolves. This will prevent the honey from sinking to the bottom of the cocktail. 2. In a glass, muddle the ginger slices into the honey or simple syrup. If you do not have a muddler, use a wooden spoon. 3. Fill a shaker with ice, add tequila, lime juice, and muddled ginger mixture. Shake vigorously until cold and combined. 4. Wet the rim of two cocktail glasses with lime. Pour some of the spice mixture into a flat dish. Dip the wet rimmed glasses into the spice mixture. 5. Fill rimmed glasses with ice and pour margaritas over the ice. Garnish with fresh limes and enjoy! Make a simple syrup with by boiling equal parts water and Cha-cha Lima. Pour one shot of white tequila in a glass over ice, add 1/4 shot Cha-cha Lima simple syrup and four shots grapefruit soda (our fave: FRESCA). Shake. 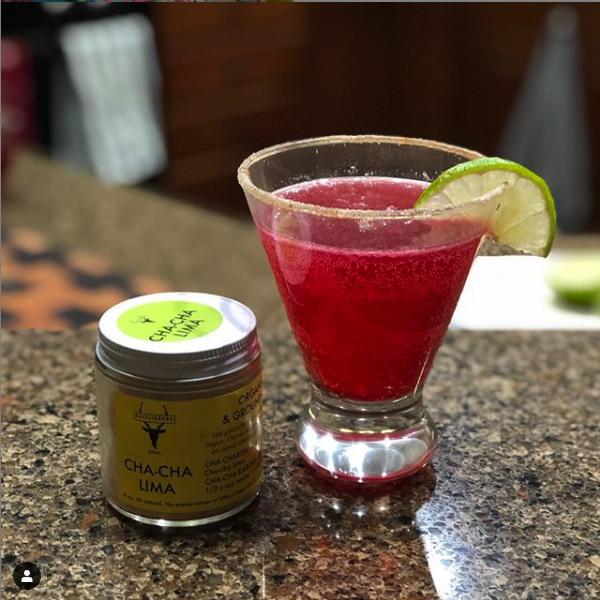 Pour into a glass rimmed with Cha-cha Lima. Garnish w lime if you got the time.